Patients of Soothing Dental, a dentist local to San Francisco, receive credit towards their out-of-pocket expenses for their next visit when it is scheduled within the next 6 months. As a member of Soothing Club each patient also receives exclusive offers through the app or the website. Regular checkups and dental cleanings are important factors when it comes to have healthy teeth. However, not that many people visit their dentist regularly unless they have tooth-sensitivity, tooth-ache or would want to perform a procedure. Soothing Dental introduces a new reward program to incentivize patients to schedule their next visit within the next 6 months. The reward can go as high as $150 and patients can use the credit to pay for the out-of-pocket expenses of their next visit. While Soothing Dental provides a concierge quality premium service, the reward program helps with the expenses to incentivize patients to do the right thing. The reward program can be combined with the referral program to promote good oral health. 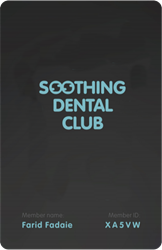 As a member of the Soothing club each patient also receives exclusive offers through the app, or the website, can book appointments, talk directly to their dentist and have access to their records. Existing patients of Soothing Dental can login to their account and see the amount of credit that they are getting for their next visit under the “Promotion” card. New patients who have not yet been to the office will see the credit after their first visit. Over the years the science of dentistry and the clinical technologies have advanced significantly. However, the way that patients receive the care has not improved and patients still have to wait anxiously in dark offices to be seen. A lot of offices cannot afford to update their equipment regularly or even to spend the time that each patient needs during each visit which creates a bad patient experience. Many still use paper forms which makes it inefficient to analyze patients' data to present the best options. Soothing Dental is addressing these issues and uses the latest technologies and procedures and innovative approaches to keep everyone's teeth healthy. Soothing Dental provides a wide range of services including composite fillings, Invisalign (or invisible braces), whitening, root canals and emergencies like broken or chipped tooth. As a dentist local to San Francisco, Dr. Suzie Yang, a member of Soothing Dental's team, was the first expert who offered pinhole gum rejuvenation as an alternative for gum grafting surgery to quickly and painlessly treat gum recession in Bay Area. Patients can book same-day or next-day appointments through the website or the app and be seen without wait-time when they are in the office. Soothing Dental’s office is located at 450 Sutter #2500 close to Union Square in San Francisco.